All units sold in New Zealand are the 'M' variant which measures rainfall in 0.2mm increments. The fully-integrated, corrosion-proof sensor suite is built to take all the weather your location can give. The ISS combines a rain collector, temperature/humidity sensors, and anemometer/direction vane into a single unit for optimum performance and durability. Our Integrated Sensor Suite combines our rain collector, temperature and humidity sensors, and anemometer into one package-making setup easy with great performance and reliability. 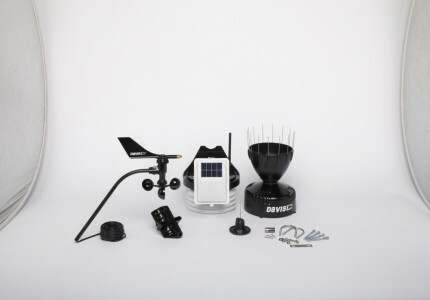 Our most popular solution for agricultural users combines a wireless Vantage Pro2 Integrated Sensor Suite with solar irradiance and daytime fan aspirated radiation shield and Vantage Connect telemetry to create a robust and reliable weather system. Wireless Integrated Sensor Suite (ISS) for use with Vantage Connect, Vantage Pro2 and Vantage Vue consoles, Weather Envoy and WeatherLink. For use with Vantage Connect, Vantage Pro2 and Vantage Vue consoles, Weather Envoy and WeatherLink. Our innovative integrated sensor suite combines our rain collector, temperature and humidity sensors, anemometer, solar radiation sensor, UV sensor, sensor mounting shelf, and solar panel into one package-making setup easier than ever and improving performance and reliability. Wireless Integrated Sensor Suite (ISS) is for use with Vantage Connect, Vantage Pro2 and Vantage Vue consoles, Weather Envoy and WeatherLink. Our innovative integrated sensor suite combines our rain collector, temperature and humidity sensors, anemometer, solar radiation sensor, UV sensor, sensor mounting shelf, and solar panel into one package-making setup easier than ever and improving performance and reliability.